Growing up in a Christian home, I always knew that God loved me. From the very beginning, before I could even remember--- I knew the songs, I'd heard the stories. I knew without a doubt that Jesus truly loved me. Still, it wasn't until becoming a mother that I truly grasped the fullness of that love. I knew that God was my Heavenly Father, and that I was His child... but to know what it truly meant to love a child of your own... well, when I learned that it made my appreciation for God's love- the unconditional, never ending love- so much greater. God Loves Mommy and Me will delight your little ones as you read about the sweet connection mothers and their children share. 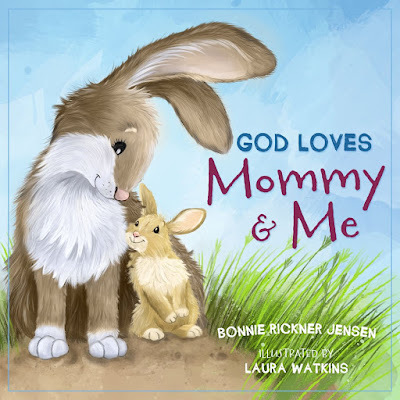 Snuggle up as you look at adorable illustrations of a mommy bunny and her little bunny sharing the day’s adventures, and read about the loving relationship God gives mommies and their children. Little ones revel in one-on-one time with each parent, and the phrase “Mommy and me” is a favorite with toddlers! God Loves Mommy and Me is a celebration of strong, loving mothers, cherished little ones, and the God who loves them all. Perfect for story time, bedtime, or any time, this sweet board book celebrates God’s gift of family. This truly is such a sweet book (and quite timely with Mother's Day coming up). Throughout the book we alternate between how God has shown His love for us--- such as the beautiful flowers in the springtime and how a mother shows love for her children--- such as kissing boo boos... Now, kids might not read this the same way as I as a mother read it, but they will see how deeply they are loved- by their mama and their God... oh what a sweet message that is! This is one book that you and your child will want to read over and over again. Want to win a copy for yourself? Head over here to enter and win.